Elizabeth, NJ - On Wednesday, January 27, on the Serbian feast of the holy hierarch St. Sava, His Grace Jerome, Bishop of Manhattan (Russian Church Abroad), celebrated the Divine Liturgy in St. George Serbian Church in Elizabeth, NJ. Shortly before the greeting of Vladyka, the wonder-working Kursk Root Icon of the Mother of God arrived at the church, accompanied by diocesan secretary Archpriest Serge Lukianov. A special and unexpected joy occurred in church: the genuine unity in Holy Orthodoxy of the Russian and Serbian peoples was tangible when, instead of the parish choir, the entire church sang the Divine Liturgy in Slavonic and Serbian. His Grace was co-served by Archimandrite Athanasy (Mastalski; rector of the Church of Our Lady "Joy Of All Who Sorrow" in Philadelphia, PA), Fr. Serge, parish rector Archpriest Zoran Radovic, Priest Vladislav Radujkovic (cleric of St. Sava’s Cathedral in Manhattan), and deacons Dimitri Temidis (cleric of Holy Virgin Protection Church in Nyack, NY), Leonid Roschko (cleric of St. George’s Church in Howell, NJ), and Nathan Mousselli (cleric of St. Alexander Nevsky Cathedral in Howell, NJ). Also praying in church were Archpriest George Zelenin (rector of St. Michael Church in Paterson, NJ) and the Hon. Branko Radosevic, Consul General of the Republic of Serbia in New York City, who came to share in the joyous festivities. In his sermon, Bishop Jerome joyously noted how many festal events, or "Slavas," were coinciding that day: not only was it the feast of St. Sava, but also the Leavetaking of the Theophany, the feast of St. Nina, Equal-of-the-Apostles, and, due to the Sunday of the Publican and the Pharisee, also a fast-free Wednesday. 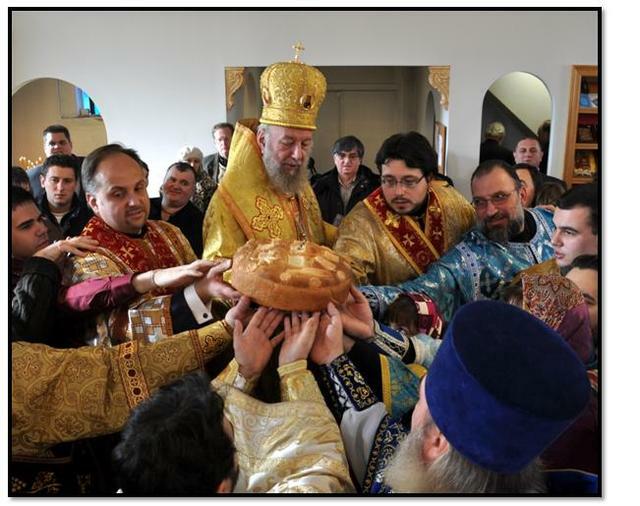 Upon completion of the Liturgy, the Serbian "Slava," or traditional blessing of the kolach bread, was performed. After the reading of the prayers of the rite, the priests and the people lifted the round, decorated breads into the air and spun them, singing "Rejoice, O Isaiah." The deacons then proclaimed the polychronion to the newly elected Patriarch Irinej of Serbia and to all those present. After the service, a bountiful luncheon was served in the parish hall, during which the parish children presented a beautiful repertoire of prayers and poems dedicated to the feast. On behalf of the parish school, Fr. Zoran presented the Consul General with a book on the life of St. Sava. Fr. Serge then presented the photomontage of the Kursk Icon’s visit to Russia in September.